A mess. A beautiful, nostalgic, noisy mess. On the spectrum of these kinds of Spielberg-a-like gang of kids on an adventure which must include at least one obligatory bike riding scene movies, Goonies tends toward light and saccharine rather than genuinely moving, but it's all in good fun. I recently rewatched this for the first time in over ten years. I was surprised to find that it didn't quite hold up to my action packed, totally awesome memories. 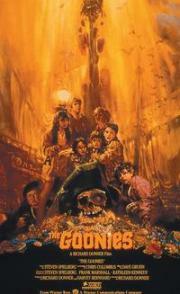 I probably shouldn't have been surprised, but "The Goonies" suffers from a pacing problem and just isn't quite as exhilarating as it should have been, though it is still a very fun adventure movie. It doesn't quite have the same magic as it did when I was a kid, but it still holds up reasonably well. I really wish the kids didn't shout so much though, it's exhausting. Get off my lawn etc.